Want to have the best Halloween wreath on the block? 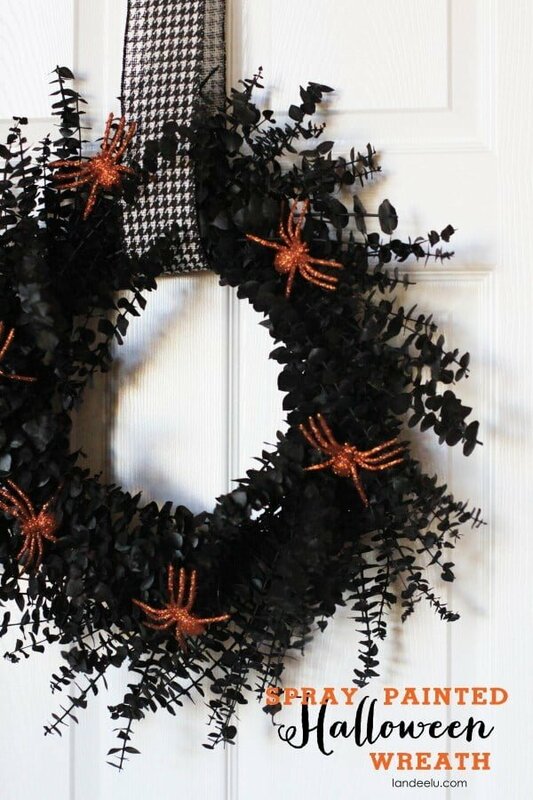 These DIY Halloween wreaths and ideas will set you on the right path. 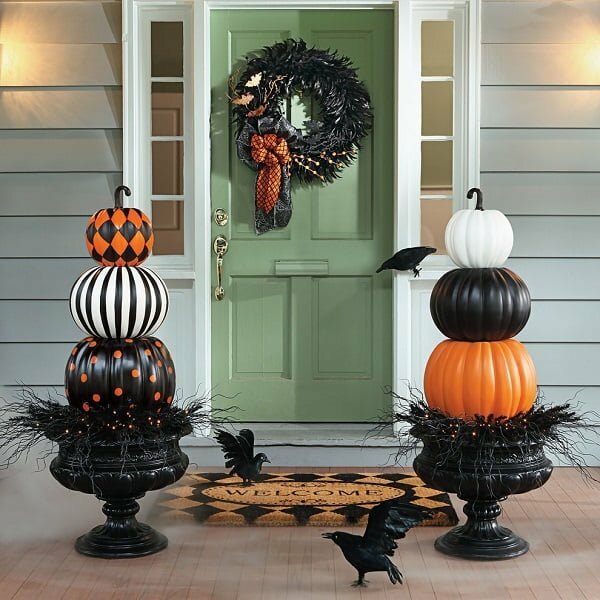 The Halloween wreath on your door tells a story about your decor and festive mood. Do you want to scare your guests or do you want them to fall in love with your decor? Do you want the trick or treaters to take you seriously or do you want a conversation piece in your front door decor? 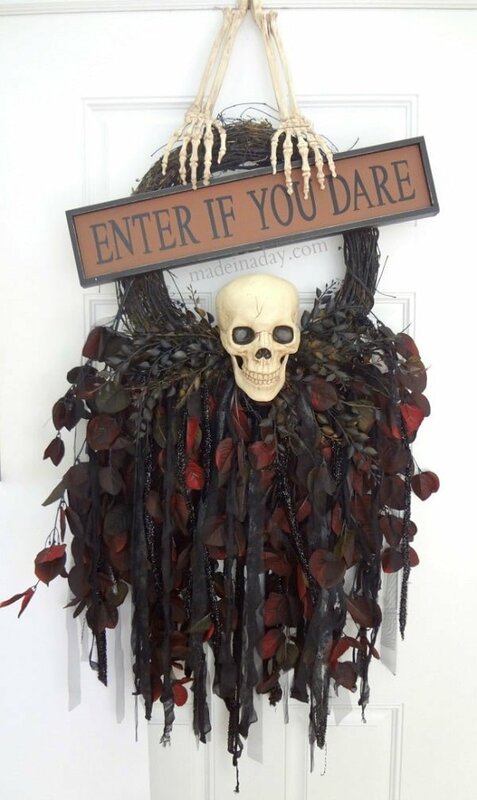 Whatever your goal this Halloween, you need a ton of ideas to choose from and make a unique wreath. So we have picked up 20 DIY tutorials and ideas for the Halloween of 2018. Check these out. It’s time for some Halloween wreath goodness! Other DIY wreaths: spring wreaths, fall wreaths, Christmas wreaths. Halloween threads don’t have to be scary; they can be cute or witty too. 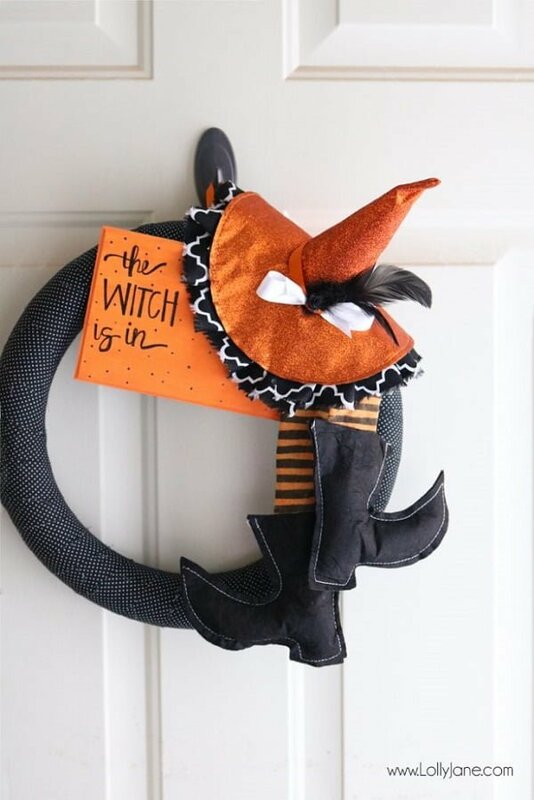 This wreath sporting black and orange colors (both of which are great for Halloween) features a witches hat and shoes as well as a sign. The wreath is witty, and you can be sure it would get a lot of attention. And the best part is that you can make this thread at home by following the tutorial which is provided. Check out the idea, follow the instructions, and don’t be afraid to experiment and add something unique to it. The orange and yellow colored candy corn is so popular during Halloween. But you can use it for something more than just treats. You can make a beautiful Halloween wreath from it. Be careful though – it’s not edible anymore! There’s a tutorial for this wreath too. 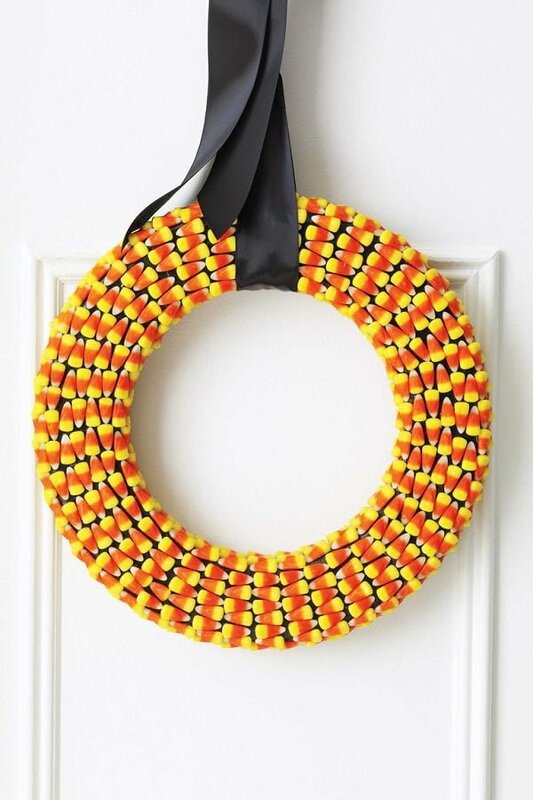 You will need a styrofoam wreath ring, duct tape, candy corn, and glue. Then follow the instructions to put it all together. Now, this Halloween threat is spooktacular. The black skulls are very imposing and at night they can be quite scary. 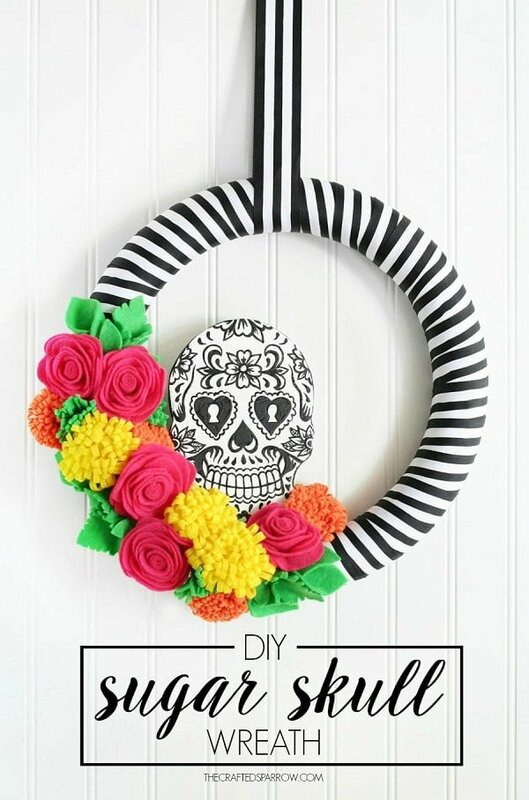 You can create this wreath from Dollar Store items too. Better yet if the little skulls have lights in them. There’s a tutorial for this wreath, so you can check it out and see how it’s done. All you need to craft this project should be available in a Dollar Store. Have fun! Time for some fun if a bit cooky Halloween decor. 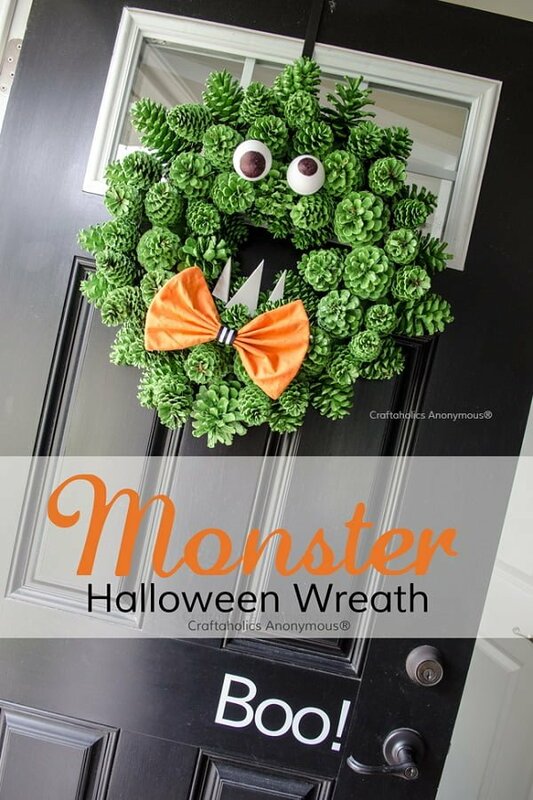 This green pinecone wreath with googly eyes and an orange bow makes such an adorable monster. And the great thing about this wreath is that you only need a bunch of pinecones to make it. You can find them in a local park or woods, or in the Dollar Store. You’ll need the popular styrofoam wreath form and a hot glue gun for this project. The tutorial says to spray paint the pinecones with green paint, but you can go with the natural color too. 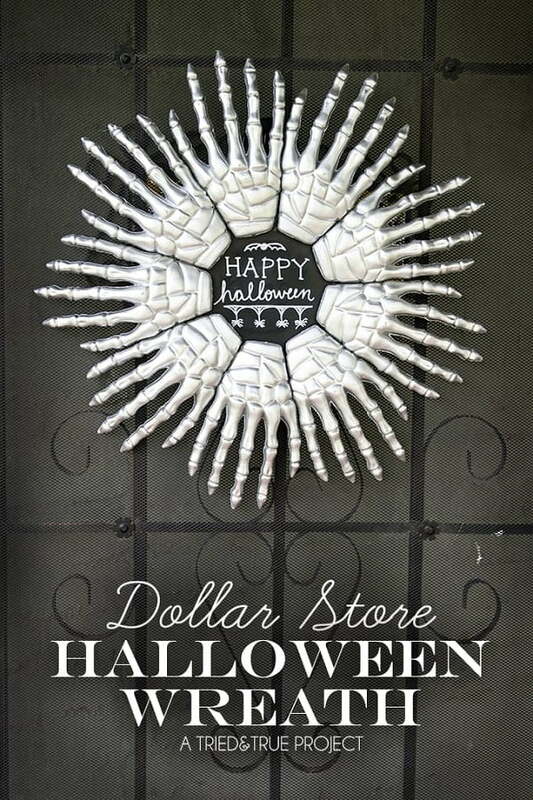 Here’s another awesome Halloween wreath made of Dollar Store items. It’s pretty spooky too. That’s what skulls and spider webs do. Some glitter added to it makes it even creepier. This is another project with a tutorial that you can do for your Halloween decor. Check out the list of items you will need in the tutorial. And have fun crafting it! 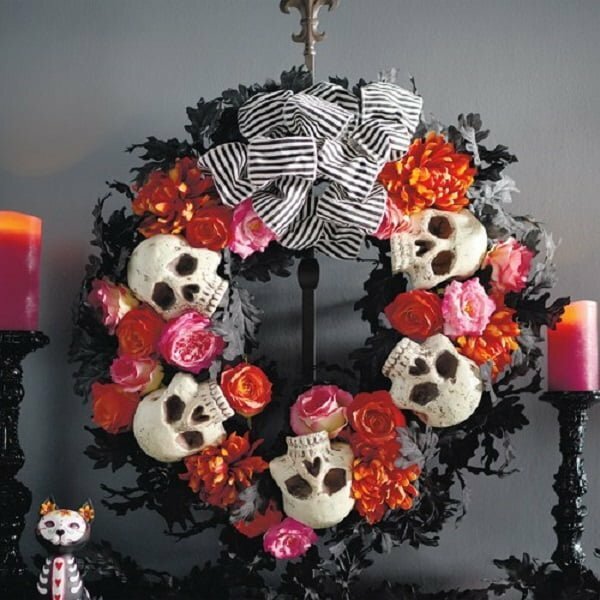 This Halloween wreath is a beautiful piece of decor, and the only thing that reminds us of the occasion is the sugar skull. It’s a unique way to decorate your door nevertheless. The black and white striped ribbon goes so well with the colored felt flowers too. You can make the wreath entirely from scratch or make it from crafts store items. It’s up to you how involved you want to get. Most importantly, have fun with it. 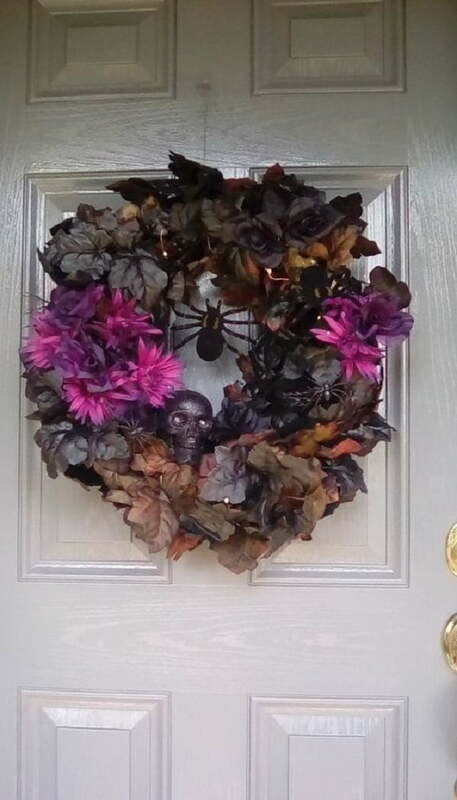 This skeleton Halloween wreath isn’t sooky; it’s just awesome. It’s amazing what you can do with Dollar Store items and some metallic spray paint. This is a creative project and a uniquely stylish way to decorate your front door for Halloween. 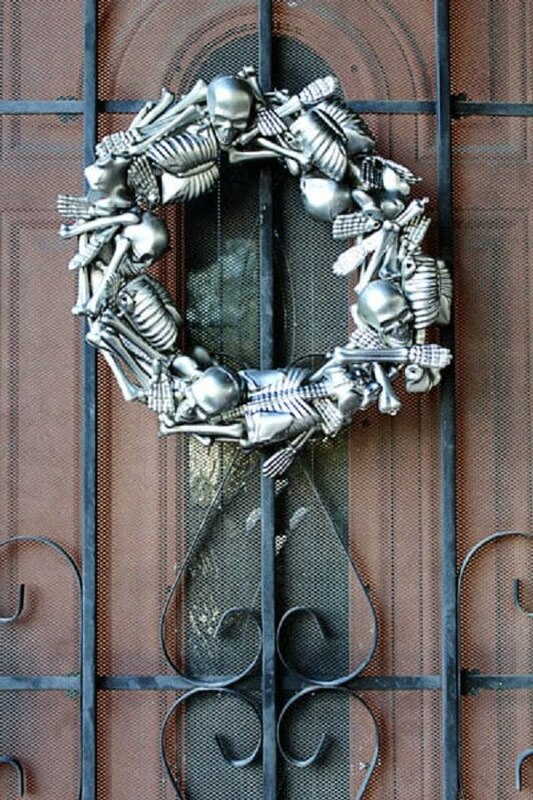 You will need a foam ring, and disassemblable skeletons to make this wreath. And of course spray paint of your choice. Everything else is explained in this tutorial. The ribbon Halloween wreath cannot be any more simple to make. All you need are a few rolls of pattern ribbon of your choice and a foam ring. Pick the ribbon and wrap it around the ring as shown in the tutorial. You will get the style that you want. This wreath idea can be easily adapted to any occasion too. It all depends on the colors and patterns of the ribbons you choose. How do you get a Halloween wreath out of any regular wreath? You take black spray paint and paint it. 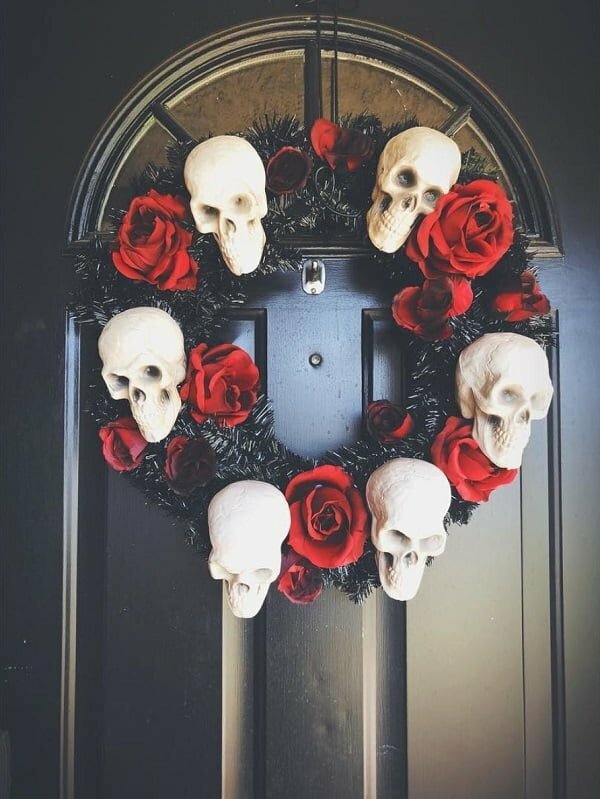 That’s all it takes to get a spooky looking wreath for your front door decor. Add some spiders to that and you’re ready for business. The best part of this DIY wreath is that you can use any wreath you have available. No choice is a bad choice here. Let’s make some spooky wreaths! All it takes is finding something interesting in the Dollar Store. And this time of the year there are plenty of Halloween props and decor items to choose from. You can make wonderful wreaths from something as simple as skeleton hands. It’s pretty creepy too! To add more interest to this wreath, use a chalkboard circle to write your Halloween message. It’s a unique piece for your front door decor for the occasion. This skeleton skull Halloween wreath is elaborate, but it’s just the scary decor that you need. The detail in this project is amazing. Everything from the skeleton skull to the skeleton hands and dried florals with black ribbons creates such an eerie look. The board sign is just the icing on the cake. You can write your message too. 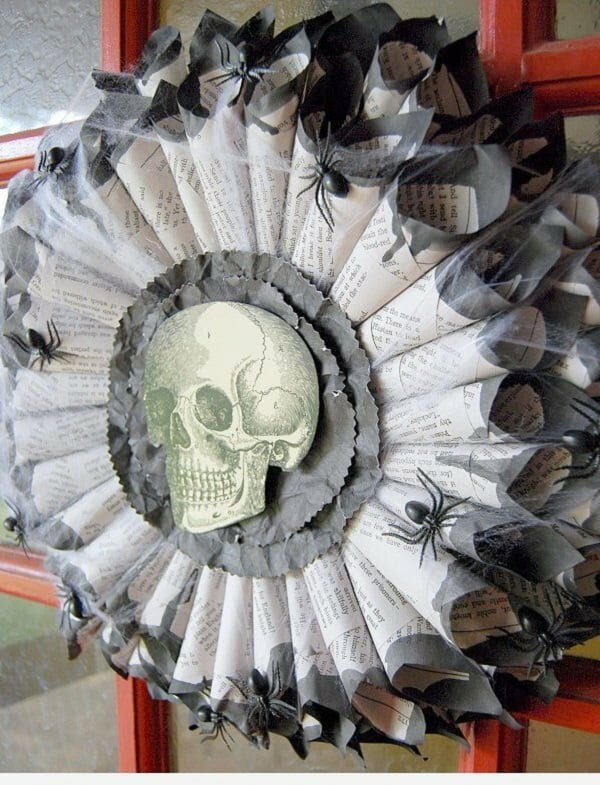 So check it out how you can make such a Halloween wreath also. Floral wreaths can be spooky. That is if you decorate them in Halloween style. All it takes is some spray paint, skulls, and spiders. For an increased effect add some Halloween lights to it (any string lights will do). This DIY Halloween project was made for $8 from Dollar Store items. So it’s a quick and easy way to design your wreath for the occasion without having to splurge on it. Spiders, spider webs, skulls and torn pages of an old book (black magic book?). That makes one creepy and scary DIY Halloween wreath. And you can make it too. It’s amazing how easy it is to make and how creepy it is at the same time. This is one of the rare instances where you don’t even need a foam wreath shape to make it. All you need is a piece of cardboard (a pizza box will do) big enough to make a wreath. 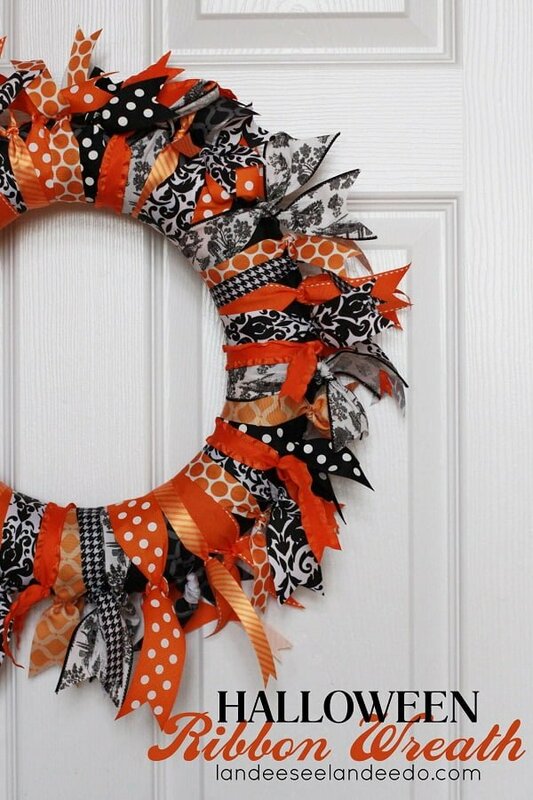 This wreath idea is very much fit for fall, and it will do as mild Halloween decoration. It will not be your main Halloween wreath, but you can use it for decor the entire fall season. Having a bunch of ribbons is all it takes to make a beautiful wreath. 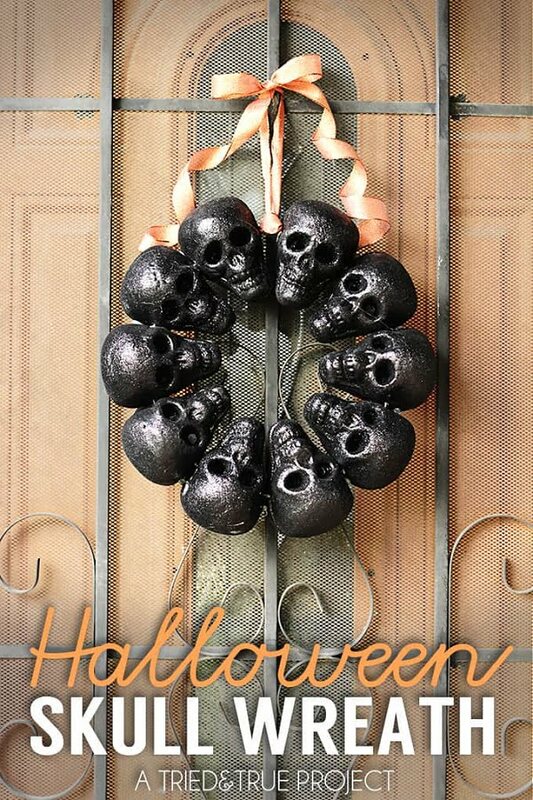 Add some creepy skull props to it, and it’s a fantastic Halloween wreath. It’s very busy but spooky enough for your trick or treaters. Halloween wreaths don’t have to be all orange and black; other colors work too. This eclectic wreath based on a sugar skull isn’t spooky, but it puts you right into the festive mood. 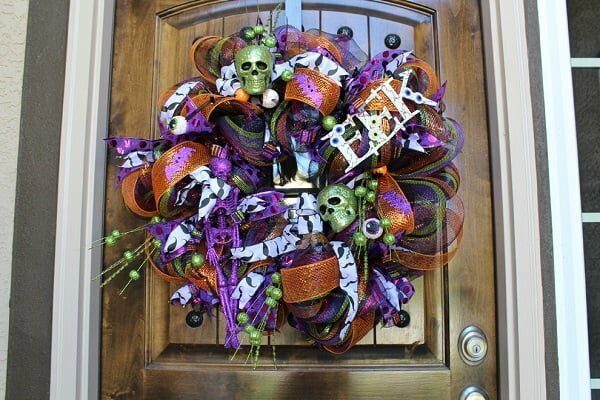 If your goal isn’t to scare trick or treaters away, this wreath is the perfect front door decoration for the festivity. Pumpkins still work in Halloween decor no matter how overused this theme might look. They are and will be the icon of the fall season. So having them as the theme for your Halloween wreath is the classic way to go. What can make a floral Halloween wreath better? Of course, skulls and ribbons. All you have to do is pick the colors right. 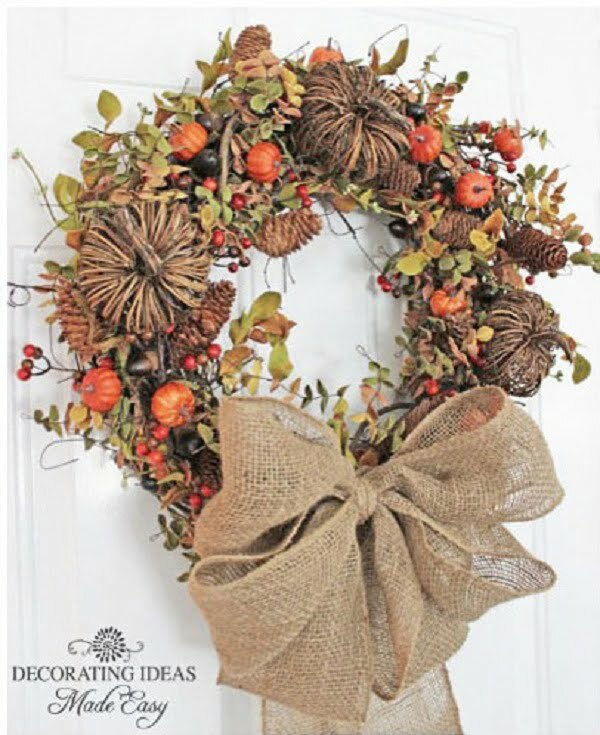 Another wreath that’s good for all of the fall season and not just Halloween. 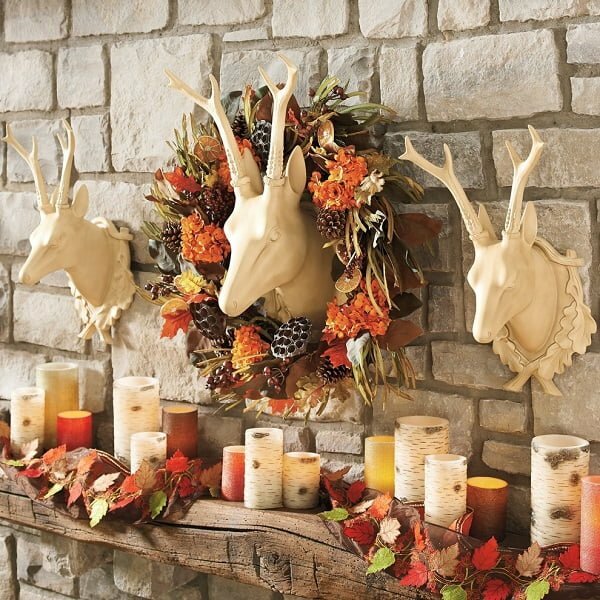 To make a better Halloween thread we’d add some spiders or skulls into the mix; even some spider webbing would do to make the faux deer heads spooky. 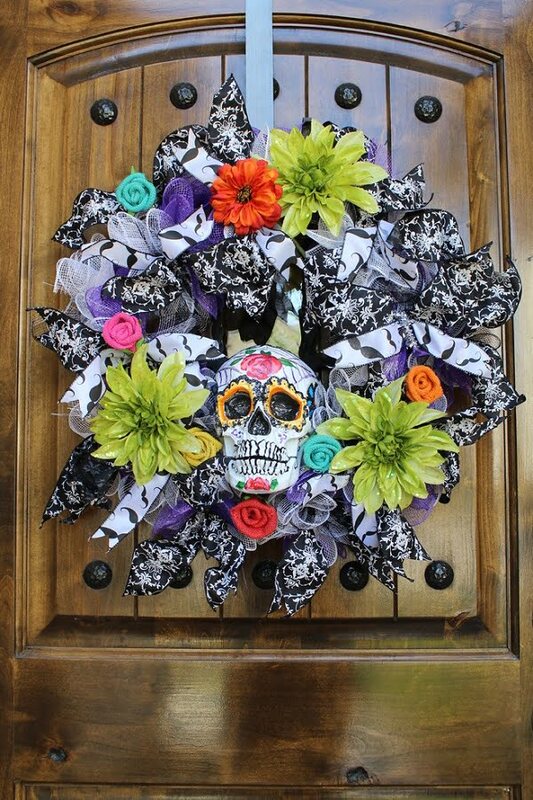 This Halloween wreath is one of our favorites. It’s simple, classy but it is very impactful. White skulls and red roses work so well on a black painted floral wreath. It may not be a big of a deal for the little trick or treaters, but it will be a big hit for a grown-up party. If clowns won’t scare the trick or treaters, then nothing will. 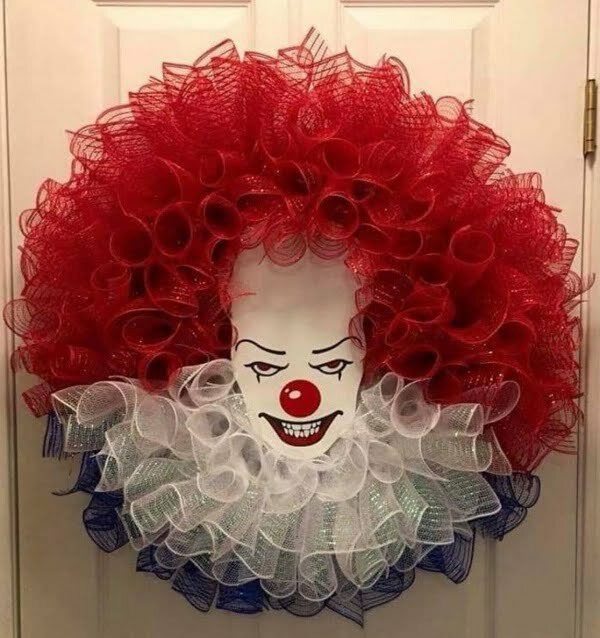 This clown head Halloween wreath with ribbons is creepy enough to scare even adults. If you want to do that this wreath is the way to go. We’d add a floating red balloon somewhere near too.